It is an excellent plant addition, especially for container gardening, whether indoors as a houseplant or outdoors in the garden. Such a decorative evergreen plant with brilliant orange-red cherries to enjoy! Meaning, simply to see, touch and feel but never to consume as they are inedible and poisonous to humans and pets. Be mindful please! 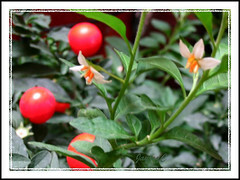 Features: S. pseudocapsicum or Jerusalem Cherry is a semi-woody and fast growing perennial shrub that can range from 0.7-1.5m in height, with erect stems that are extremely branched. 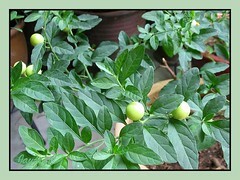 It belongs to the same botanical family which includes the potato, tomato, eggplant and deadly nightshade. Its lovely foliage is evergreen and colored deep green or bluish-green. Glossy leaves are alternate, narrowly elliptic and pointed, veined underneath and have slightly wavy margins. It produces numerous small star-shaped solitary flowers that are followed by glossy, round (1-2cm diameter) and succulent fruits with many tiny seeds inside. 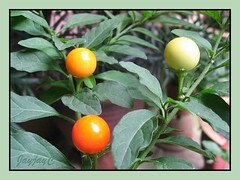 Immature fruits gradually color through light green to cream-yellow before ripening to bright orange-red – though beautiful at all stages yet poisonous, and that include the leaves and stems too. 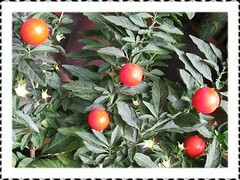 This very decorative plant, well-known for its colorful and long-lasting (about 3 months) fruits that resemble very closely the Cherry Tomatoes are popularly sold during the Christmas/winter season, hence its common names Christmas Cherry and Winter Cherry. Available at nursery centers are usually the cultivated dwarf varieties, much compact and shorter than those growing wild and considered as weeds in some areas of Australia and New Zealand. 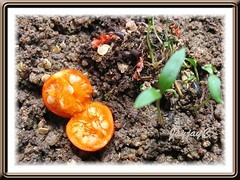 Culture (Care): An easy-to-grow plant with minimal maintenance. Light: Bright light and cool-to-moderately warm temperatures indoors. Outdoors, full sun to filtered sun or partial shade. 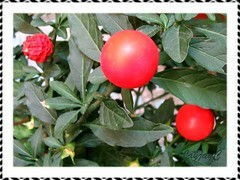 Grows best in sunny location, but do not expose to harsh sunlight that can scorch its foliage. Moisture: Requires medium water regularly. Water well and let the soil become moderately dry between waterings. Do not over-water. It needs adequate humidity, so either mist regularly or stand potted houseplant in a saucer of pebbles filled with water almost to the base of pot. Soil: Preferably compost-enriched potting mix that retains water, yet drains well and is well aerated. Others: Leaves falling other than in winter is generally a sign of over-watering whilst berries dropping indicates insufficient light, high temperatures or hot dry air. So, locate plant to a brighter and cooler site. Give the shrub a hard prune when fruits have dropped to encourage bushiness and promote more fruiting. Even pinching stem tips will encourage bushy growth. Feed every fortnightly with a water soluble fertilizer at half strength when the plant is actively growing, otherwise once monthly. If it is grown as a houseplant, take it outdoors when it is flowering to be pollinated by insects. Or tapping its stems to shake out the pollens and misting the flowers can assist pollination. Jerusalem/Winter/Christmas Cherry is prone to whiteflies, mealy bugs, aphids and spider mites attack, so check plant regularly. We almost lost our plant in early April when it was heavily infested with mealy bugs. Thus given a drastic prune right down to about 12cm above ground. Fortunately, it took well to hard pruning and came bouncing back healthily, even producing fruits within 4 months, as seen in these images. For temperate zones: Hardiness: USDA Zone 9b-11. Read more at Dave’sGarden and Purdue Uni. Consumer Horticulture. Usage: Being compact and decorative, Jerusalem Cherry makes excellent container or pot plants, that can be ideally grown as a house plant or in greenhouse/conservatory. Also, widely used for interiorscape in offices and shopping malls because of its ornamental attraction. Lovely as an indoor winter decorative plant, especially for frost affected regions. Outdoors, it will be excellent on ground in garden border and bed, or potted and located at porches and patios. Berries are attractive to birds. Do you sell these plants? How or where can I buy one or some seeds? Sorry, Terry! We do not sell them, neither do we know where you can buy them. Thanks for your appreciation, Maryam! Hi! I have a decorative cherry plant, 35 cm tall, potted in a small container. The leaves are growing yellow; the cherries are shrinking and getting dry and eventually fall. This has made me sad indeed. Would you prescribe how to deal with it please?